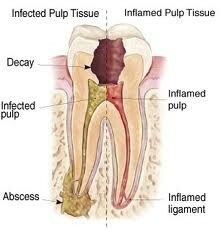 Periodontal disease takes many forms. The first time someone may become aware of it is by noticing bleeding gums or simply bad breath also known as Halitosis. This can be an embarrassing problem for many people but it is easily curable. There are two main forms of gum disease: gingivitis and periodontal disease. It is caused by an accumulation of plaque and calculus around the teeth, lack of proper brushing, flossing or using a water oral irrigator to remove food debris after eating. It is also caused by ill fitting crowns and leaky dental restorations. means an acute inflammation of the gums. causing extreme pain, bleeding and ulceration. 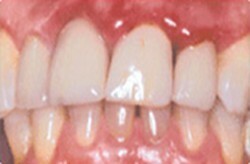 The papillae get damaged extremely rapidly as in the picture. This occurence which may develop within a few hours needs the most urgent attention. If unable to get to a dentist, rinse repeatedly with hot salt water followed by live yoghurt. 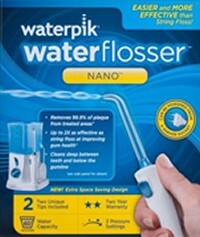 Use a waterjet oral irrigator to clean your teeth. Do not use any antiseptic, tooth paste or mouthwash which are usually the cause of this condition. 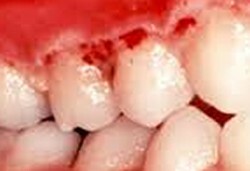 Long-standing gingivitis can turn into periodontal disease. As the disease gets worse the bone anchoring the teeth to the jaw is lost, making the teeth loose. If this is not treated, the teeth may eventually fall out. Lack of plaque and calculus removal over a long time allows bacteria to produce toxins which bring about bone loss and deep pocketing develops around the teeth. This eventually results in the loss of the affected teeth if not extensively treated by a dentist or a periodontist. Halitosis can simply be caused by improper cleaning of the teeth and gums which leaves trapped food between the teeth which in time putrifies because of bacterial action. Dental decay and defective fillings are also the other major cause of halitosis. If left untreated bacteria create toxins and acid in the mouth causing gum recession and bone loss unless appropriate measures are instituted. Please read my salt article. Antiseptic mouthwashes are the most dangerous invention and work against the basic tenets of medicine and must never be used and are ofetn the root cause of halitosis and severe gum disease and bone loss, as it has often been noted in many patients seeking treatment. These can also cause severe naso-pharyngeal tube infections with a swelling of the superficia;l cervical lymph nodes. Repeated use of mouth fresheners while appearing to control halitosis make the condition more chronic. A chronic sore throat is not uncommon amongst some patients following regular use of Lozenges also. If left untreated further damage to the tooth supporting structures can occur, bringing with it additional risks to overall health. Please also read about other factors which damage the gums and teeth. Scaling and root planing is a common way to treat periodontal disease without the need for surgery. The bacteria and infection will be removed from the tooth below the gum line by scaling the tooth to remove tartar and also the plaque that has built up in this area. Bone and tissue regeneration is a periodontal procedure that can be used if the disease has caused very serious damage. The bacteria and plaque are removed from the teeth, and membranes, and bone grafts are placed on the area to stimulate tissue growth and allow the tooth supporting structures to regenerate. The importance of brushing teeth should be ingrained in children from a very early age. The act of flossing every day is important to remove food that the toothbrush cannot reach. 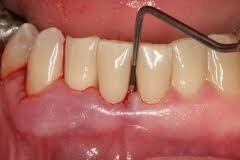 The posterior teeth should be cleaned with an interdental brush also. 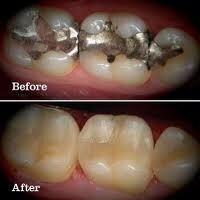 Always water jet your teeth after you have flossed as this is the most effective routine to keep plaque at bay. You have a lot to think about during pregnancy but staying on top of your dental needs is critical since pregnancy can take a toll on your teeth and gums. Please read my article on Salt use instead of mouthwashes etc. Make sure to tell your dentist that you are pregnant and about any changes in your oral health that you may have noticed. 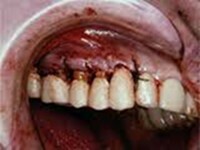 During such treatment many patients complain of severe bleeding gums. This is often due to the unnecessary use of mouthwashes. If you follow the advice given in the above mentioned article it is more than likely that you will not run into this problem. Taking care of your teeth and gums isn't just about preventing cavities or bad breath. The mouth is a gateway into your body‘s overall health. The teeth provide an anchor to correct bodily asymmetries. This is a constant theme throughout this website. It is extremely important not to jeopardise dental health as the loss of any one tooth can seriously affect overall body symmetry and consequently your health. Periodontal disease can also exacerbate existing heart conditions. Patients at risk for infective endocarditis may require antibiotics prior to dental procedures. Your periodontist and cardiologist will be able to determine if your heart condition requires use of antibiotics prior to dental procedures. We would all like to have the perfect smile and today there are so many ways of improving the way we look through the advances of cosmetic dentistry. One option open to people considering cosmetic dentistry is gum contouring, which is a form of reshaping the gums. This ideally suits patients who might have what is known as a ‘gummy smile’. To be more specific, this is where the gums cover too much of the teeth. Traditionally the process of gum contouring has been carried out with a scalpel, although more and more dentists are nowadays opting to use more modern special laser devices to achieve the desired effect required by the patient. Here’s how it works: anaesthetic is applied to the area of the inside of the mouth which is being targeted and then a scalpel or laser are used to trim away parts of the gum which lie over the teeth. Crowns and veneers may be used once the procedure is complete during what is usually a pretty simple and painless process. A significant difference between using a scalpel and a laser are that the latter is able to seal blood vessels during the procedure, which reduces the bleeding. Due to the use of anaesthetic, the patient should find the experience relatively pain free while it is being carried out. There is a fairly quick healing process too, although it may take longer if a scalpel is used. Treatment involves appointments for cleaning and oral hygiene. Most problems can be brought under control fairly quickly without complex treatment. To improve the state of your periodontal health please phone us to make an appointment. 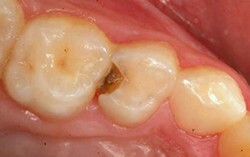 Abrasion cavities similar to these are a common occurence and are caused by an over zealous tooth brushing technique. 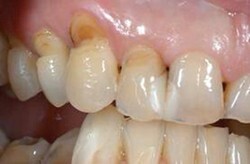 If left untreated the teeth decay as shown by the yellow brown stains on the right and also become extremely sensitive. 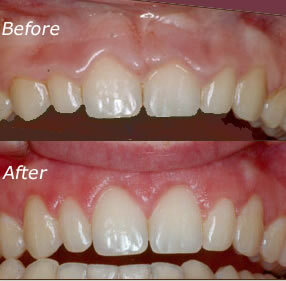 These teeth are usually restored with Glass Ionomer fillings and occassionally composite resin fillings. 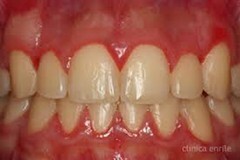 Heavy brushing also cuts away the gum needing more complex treatment as shown in the video under periodontal disease. 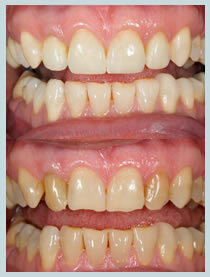 Again these teeth are restored with Glass Ionomer fillings and occassionally composite resin fillings. Fractured teeth can be simply repaired with composite resin fillings and if adequate care is taken can last very many years. With the advent of Cerec restorations a milled restoration can also be added which is less likely to stain as its composition is much denser. Amalgam fillings are out of use now. If done well these fillings often lasted a lifetime. However, apart from being very unsightly there are serious issues raised as per the film opposite. 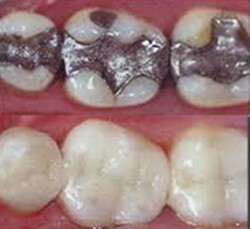 Amalgam fillings are usually restored with composite resin fillings. 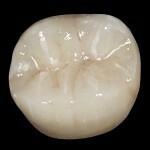 The major downside of composite resin is that these fillings abrade over time and may have to be replaced. 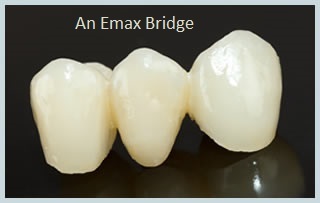 We also use Ceramic, E.max or Enamic inlays as per the picture on the right. They are constructed with CAD/CAM technology and are done on the same visit. These are very long lasting if done correctly. Gold inlays are still highly desired and make an excellent restorative material for inlays, onlays and crowns. Gold blends in with the changing bite of a patient. We often use gold for teeth at the back of the arches. 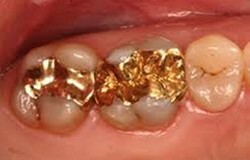 Gold also needs less cutting of tooth material and is excellent in protecting the remainder of heavily damaged teeth. CEREC, an acronym meaning Chairside Economical Restorations of Esthetic Ceramic is used to restore a patient's damaged tooth or teeth. We use the latest in dental technology. We are pleased to announce this latest offering - CEREC one hour crowns and fillings. This new procedure provides a natural match by using a ceramic or a composite material that also eliminates unsightly discolorations. This device uses a special camera to take an accurate picture of the damaged tooth and is then transferred and displayed on a color computer screen where the restoration is designed. When satisfactory the instructions are sent to the milling unit to mill the appropriate crown, veneer or a filling. 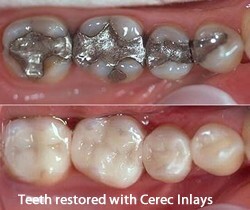 Before CEREC technology, crowns would generally take a week to finalise. The appointments would consist of preparing the tooth, taking an impression, fitting a temporary crown and then installing the permanent crown at a later date. 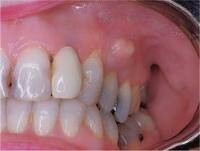 All of this is now eliminated by using CEREC one hour fillings and crowns. If you need any aesthetic dental fillings please phone us on 0208 780 3433 to make an appointment. 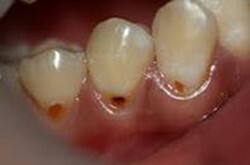 Root fillings are used to replace the nerve in a tooth which has died through trauma or decay. 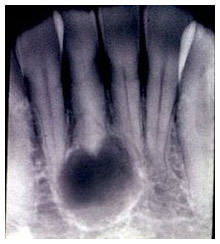 The picture on the left shows the dark coloured root canals in healthy teeth which are the living vital nerves. If a tooth starts decaying and if it is not properly restored in time the toxins from the bacteria start damaging the nerve which initially gets inflamed and later dies as per the picture on the right. The damaged nerve can eventuallly form an apical abscess. Some teeth with a chronic apical area may form a cyst which needs surgical attention to curette the infection out. This procedure is known as an apicectomy. 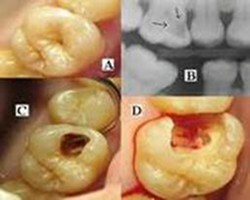 The tooth can be saved with a root filling as shown in the picture on the right. If you have a tooth needing endodontic care please phone us on 0208 780 3433 to make an appointment. 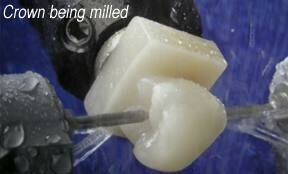 Before CEREC technology, crowns would generally take a week to finalise. 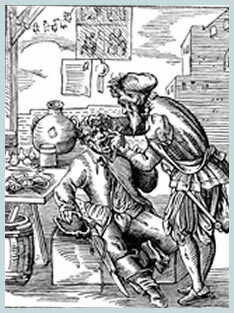 The appointments would consist of preparing the tooth, taking the impression, fitting temporaries and then installing the permanent crown on a subsequent visit. 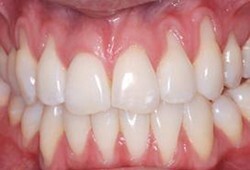 All of this is now eliminated by using CEREC one hour fillings and crowns. 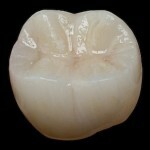 IPS e.max has become the industry standard material for metal-free, all-ceramic restorations. IPS e.max provides unmatched strength (360 - 400 MPa flexural strength) and versatility. We are fully equipped to provide an in house service with a turn around time of only 3 days. Pressed full contour all-ceramic crowns provide your best choice for strong, metal free, and highly esthetic restorations. The high translucency lithium disilicate material allows natural tooth color to show through and picks up chameleon effects from the prep and adjacent teeth. 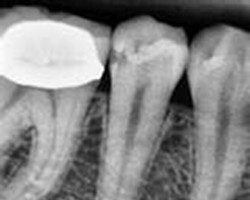 Recent advances in the field of CAD/CAM design have opened a new door in the field of dentistry. This advanced technology, teamed with the high strength of zirconia are creating beautiful, strong, and highly accurate restorations. We have an inhouse Zirconia sintering furnace and CAD/CAM equipment to complete the work with a one week turn around time. Full-contour zirconia crowns are the strongest, most fracture resistant, tooth coloured restorations in dentistry today. 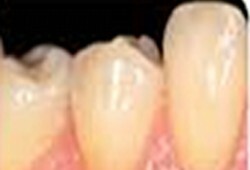 When a full-cast gold crown is contraindicated due to colour Zirconia is an ideal replacement. Layered zirconia restorations are esthetically exceptional and have shown a lower failure and fracture rate than either metal-ceramic or metal-free ceramic restorations. We offer zirconia bridges, splinted single units, and free standing single crowns. 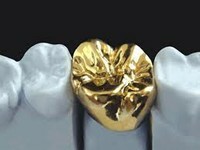 The porcelain fused to gold crown has been the standard in restorative dentistry for decades. The predictability and reliability of VMK crowns have allowed them to stand the tests of both time, and technology. There are some situations where we still need to employ such a technology to conserve teeth. 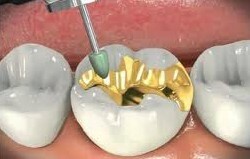 While most patients request tooth color for their restorations, a significant number still opt for the beauty and functional stability of gold. They are especially useful where the original tooth is very small and only very little preparation is possible. They are also exceptionally useful towards the back of the mouth on the last tooth to provide much needed stability. There are a number of reasons why surgery in the mouth may be necessary. Here the teeth on the right of the patients' mouth have had the procedure done. It is used to clean the gums deeply, contour gums and correct periodontal problems. 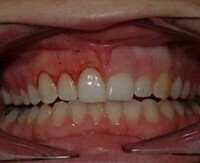 This is an example of treatment of advanced gum disease with deep pocleting where the gum has been cleaned up and stitched close to the residual supporting bone. These procedures are used to carry out lip fraenectomies and remove tongue ties. Here sometimes we have to make an incision to relieve a developing swelling from an apical abscess. Root filled teeth which continue to give problems may need a procedure to cut the apex of the tooth and fill the tooth from the root end and also to enucleate any cyst. This procedure is known as an apicectomy. Here some teeth have to be extracted surgically. There are occassions when we have no choice in cases of advanced decay, tooth fracture or severe bone loss through gum disease. The most common association people have of dentures are a full set of removable false teeth. Dentures are not an option to aspire to. You will note from these pages that it is imperative to preserve all your teeth. Teeth are an anchor to correct the asymmetries of your head and body and as such need the utmost care and preservation. However in some cases it is already too late so a description of basic dentures follows. 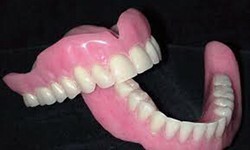 We can make very intricate dentures also which are supported by precision attachments or some standing roots can have special fittings placed over them to anchor the denture. The top denture relies on "suction" to retain it, and the hardness of the underlying tissues for its stability. It generally takes 4 or sometimes more appointments to make a set of standard dentures. If you have a spare old set which you can do without than it is possible to make it in only two visits as this set can be used as a template. The construction of conventional dentures will take place over a number of visits. A wax model will be made of the inside of your mouth. This wax model will be sent to a dental laboratory for the denture construction. With conventional dentures the most important part of the procedure is the try in phase. This stage of the procedure is vital in order to achieve the correct fit and size of the dentures and to find out that you are satisfied with the appearance and feel of the denture. 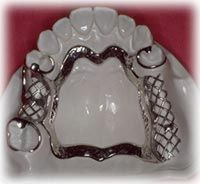 Partial dentures can be made from acrylic as are full dentures or can have a Chrome cobalt framework as shown in the picture. The alloy framework makes it easier to keep some parts thinner and also allow the remaining teeth to bear the load of the denture. More recently it has been possible to make dentures from a flexible material. These can be much thinner and have tooth coloured clasps instead of metal ones. These are also much more resistant to breakage. These are the comfortable, beautiful, and affordable choice. It was long thought that removable partial dentures had to be rigid to be effective. The innovation of the Valplast Flexible Partial allows the restoration to adapt to the constant movement and flexibility in your mouth. The flexibility, combined with strength and light weight, provides total comfort and great looks! 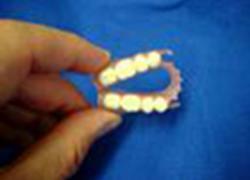 Denture cleaning: The cleaning of dentures really depends on the type of dentures you have. If you have a partial denture with only one or two teeth fixed to a plate, then you will need to clean them as part of your at home dental care routine, and they should be brushed every day to remove food particles and plaque. A full set of either upper and/or lower dentures should be cleaned in a soaking solution; if dentures are left in the open air they will dry out and loose shape. 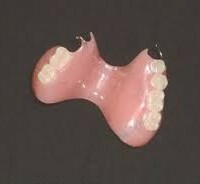 Longevity of dentures: Over time dentures will become loose due to natural shrinkage of the gum. Dental adhesive can be used to keep the denture firmly in place, but this should really only be a temporary solution. A dental visit should be schedule for readjustments or the fitting of new dentures. To be fitted with dentures of your choice please phone us on 0208 780 3433 to make an appointment. Jaw asymmetry including temporomandibular joint disorders develop because of a number of reasons. Approximately 35 million people in the United States suffer from TMJ problems at any given time. While both men and women experience these disorders, the majority of those seeking treatment are women. The ratio of women to men increases with the severity of symptoms, approaching 9 to 1 for patient with major limitations in jaw movements and chronic, unrelenting pain. A poor swallowing pattern during infancy causing a poor development of the upper jaw. Open mouth breathing during younger years which elongates the lower face. The lower jaw gets trapped one tooth too far back at a young age and is unable to grow. A dysfunctional jaw results in tooth grinding and as the years go by the jaw joint has less and less room to function optimally. A dysfunctional jaw can give rise to "trigger points" -- contracted muscles in the jaw, head, and neck. Trigger points can refer pain to other areas. The pain of Jaw dysfunction is often described as a dull, aching pain comes and goes in the jaw joint and nearby areas. However, some people report no pain but still have problems using their jaws. Pain in the face, neck and shoulders. Limited movement or locking of the jaw. Ear pain, pressure, ringing, tinnitus, dizziness and vision problems. Painful clicking, popping or grating in the jaw joint when opening or closing the mouth. Jaw noises unaccompanied by pain. Biting or chewing difficulty or discomfort. Difficulty opening or closing the mouth. ......and a host of other problems remote from the mouth. When going through this website you will be astonished at the vast number of other symptoms that are caused by a dysfunctional jaw joint. There are numerous websites talking in terms of "co-morbidites" or "overlapping symptoms" with claims like "No one really knows what causes TMD". This unfortunately is a mantra repeated for every other chronic disease by the medical profession who have little to offer patients whose symptoms arise primarily due to a dysfunctional jaw joint. The experience of our patients also proves this point. Temporomandibular joint disorders are the root cause of many 'illnesses' like ME, CFS, IBS, MS etc. Our blog pages show that some 80 illnesses are caused by a dysfunctional jaw joint. Reconstructive surgery of the jaw, or joint replacement, is rarely required. In fact, studies have shown that the results are often worse than before. Is based primarily on information obtained from the patient's history and a clinical examination of the teeth, jaws head and neck muscles. In addition to a detailed history through our questionnaire and a careful clinical examination, imaging studies include routine dental x-rays and panoramic radiographs. Blood tests and other medical investigations are not required except for your own physician to rule out other possible medical conditions in their differential diagnosis. Before undergoing any costly treatment, it is always wise to get an independent opinion from another health care provider. In fact we prefer to be used as the last resort when the patients have exhausted themselves of all other modes of health care. There is no medical or dental specialty of qualified experts trained in the care and treatment of TMJ patients. As a result, there are no established standards of care in clinical practice. Although a variety of health care providers advertise themselves as “TMJ specialists,” the treatment of such patients is very demanding and difficult to deliver. TMD ceases to be an isolated condition limited to the teeth and jaws. Among conditions claimed to 'overlap' with TMD are chronic fatigue syndrome (ME/CFS) , chronic headaches/migraines, fibromyalgia, irritable bowel syndrome, sleep disorders, chronic etc. which are all disorders treatable through correct interventions. In some cases, a patient may experience one symptom initially and then go on to develop others. In other cases, many symptoms may occur together at the outset. It is ironic that correct Jaw treatment resolves all these "co- morbid" and "overlapping" cobditions. We have accumulated 20 years of experience in this subject and the testimonials on this website are worth reading and perhaps you may find that one of those testimonials describes your kind of "illness". Orthodontics is carried out to improve the appearance, position and function of crooked or abnormally arranged teeth and to improve TMJ function and where patients suffer with Jaw asymmetry to correct the jaw position. Your exact treatment will depend on the problems with your teeth. In some cases, you may have to wear a headgear at night as well as a brace. If worn correctly, you are likely to achieve good results, usually within 18-24 months. If the problem is more complicated, treatment may take much longer especially in re treatment cases where patients have had a number of dental extractions. You may need orthodontic treatment if your teeth or jaws do not develop in a normal way. This can cause discomfort and make it hard to maintain good oral hygiene. In some cases, abnormal development of the teeth and jaws can affect the shape of the face. Problems with crooked and out-of-place teeth are quite common in the UK. We carry out non extraction orthodontic treatments and never extract any permanent teeth. We find that all jaws have the potential to develop to an ideal size. The numerous testimonials on this website should be sufficient to help you decide on the course you wish to embark on. 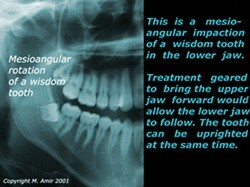 If you wish to contact us about your Jaw problems please send a brief email to amir2647@msn.com. Alternatively you can also phone us: +44 (0) 208 780 3433. You may want to go ahead and complete our extensive Questionnaire (cost L29.00 payable by Paypal only) before making an appointment. We can get you out of pain extremely quickly. We know how awful toothache can be. We run a walk in clinic or alternatively you can phone us to make an appointment. In the meantime there is some useful information on this page. Apart from a great deal of experience in dealing with dental pain we have the necessary equipment to help diagnose the cause of your pain. Our aim is to make your treatment and care at the practice as relaxing and comfortable as possible and to treat you painlessly and provide good aftercare and follow ups. We are committed to achieving and maintaining full compliance with the requirements of the Health and Social Care Act 2008 (Regulated Activities) Regulations 2009 and the Care Quality Commission (Registration) Regulations 2009. As a dental practice, we take infection control very seriously. Please see the Technology page. All of our treatment rooms are designed to the highest standards to ensure that contamination risks are minimised. All of our instrumentation is cleaned and sterilised to industry standards and staff attend routine training in infection control in order to ensure that you are safe from the risk of infection when attending for any treatment. Please note that we are not registered with the National Health Service and all consultations and treatments have to be paid for at the time of the appointment. The first time a patient feels dental pain is often after consuming sweet foods. At this stage the tooth is reparable if attended to at the very first sign of such pain. 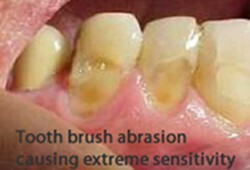 Tooth abrasion from over brushing like in the picture below, especially close to the gums where the enamel is thinnest. These cavities can be easily repaired by the use of modern Glass Ionomer fillings which are very durable. At this stage the problem is beginning to get serious and if not urgently dealt with the nerve starts to get inflamed and nerve death ensues. The tooth can still be dealt with a new dental restoration but the chances of nerve death occuring is enhanced. If nerve death ensues it can cause serious pain which needs urgent attention. Emergency treatment is started by opening the canals for drainage. 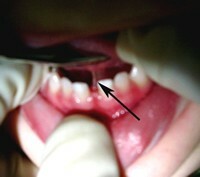 A root filling is subsequently necessary. 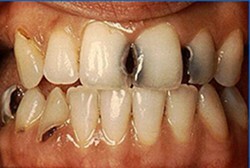 These teeth need urgent restoration with Glass Ionomerfillings and obviously stopping thehabit or ensuring that the teeth are immaculately clean soon after such consumption. 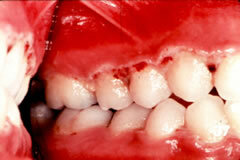 These teeth have been damaged by projectile vomiting and is often seen in bulimics. Bulimics who do not seek treatment urgently have a heavy price to pay for this damage. They are well advised to keep some milk at hand and rinse their mouth with it instantly after vomiting. These are extremely difficult to repair and often need full crowns. The damage to the front teeth is caused by the consumption of readily available soft drinks, energy drinks and fruit juices. When consuming these drinks, which have a potential of causing you serious harm other than to your teeth, a straw must be used kept well back on your tongue. Please read my article on Salt in relation to gum health. 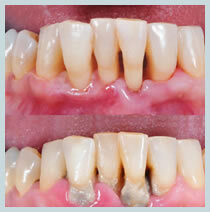 In these cases the restoration has to be removed, the decay excavated and the tooth is lined and refilled. Pain from hot drinks implies that there is nerve inflammation and the need for nerve removal. A root filling may become necessary especially if the pain is relieved by cold but exasperated by hot drinks. A) This innocuous looking tooth damage is actually quite serious. Once a tooth gets such a lesion it can cause severe decay often leaving an egg shell of enamel intact. These teeth need urgent attention to minimize further damage. 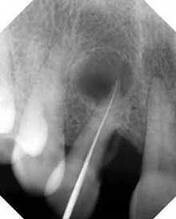 B) Radiograph shows damage occurring between the teeth and is often only seen through a radiograph. A lesion such as the one shown can lead to nerve damage. 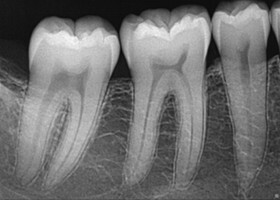 C) This is another view of the same tooth after the cavity has been opened up a bit. Consumption of soft drinks including orange or any other juice is responsible for such decay. D) Here the tooth has had most of the decay removed and it shows nerve damage. Here the necessity for the removal of the nerve appears unavoidable. The costs of saving such a tooth rises astronomically hence the need for regular check ups and restoration before teeth get to this stage. Gum abscesses like the one seen in this picture need the most urgent attention. This occurs over night and can permanently damage the papillae within hours. The cause is often overzealous use of nasty chemicals in tooth pastes and mouth washes. You must immediately stop using the tooth paste and mouthwash, wash with hot salt water followed immediately after by rinsing with live yoghurt and leaving the taste of live yoghurt in your mouth.